I guess I always had the feeling that 1994 had to be a good year. 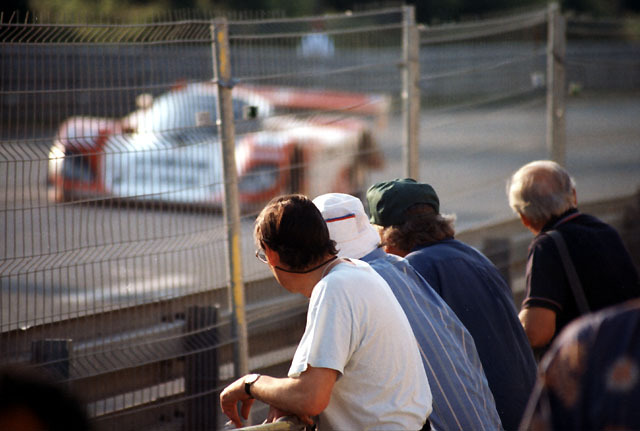 After a Tourists "no-show" in '92 (just Pierre and myself) and a limited show in '93, the Tourists were well and truly back on the Le Mans trail in '94. There were to be 10 of us this year. The regulars were back again, Ian, Martin, Alan and myself. Peter (Pierre) was making his first "full" Tourists trip. Although Chris wasn't making his first trip to Le Mans by any means, it was his first experience as a Tourist. 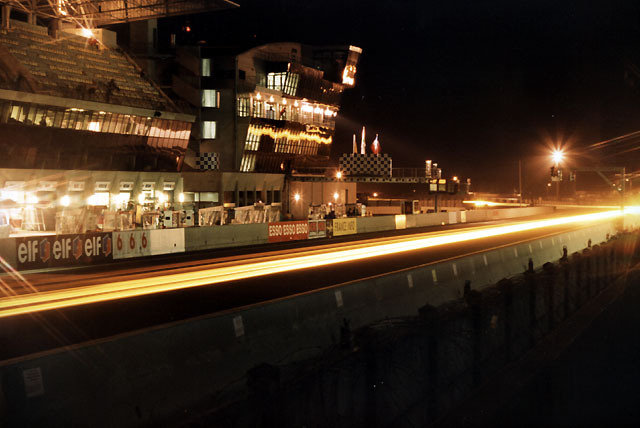 (The term having been coined since my arrival on the Le Mans scene, I tend to regard it as my own, so consequently, any trips to Le Mans prior to 1986 do not carry Tourist "status"!). 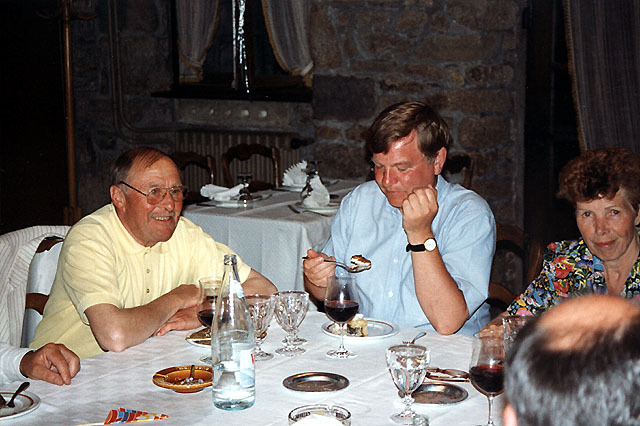 Jim was in a similar position to Chris, in that he had also been to Le Mans several times before, but had not yet been initiated into full Tourists membership! There were two newcomers in 1994, Fred, a good friend of Pierre, and Nick, a good friend and work acquaintance of Ian, who had decided to take the plunge this year. Those of an academic bent will have quickly worked out that the names mentioned thus far add up to only 9. 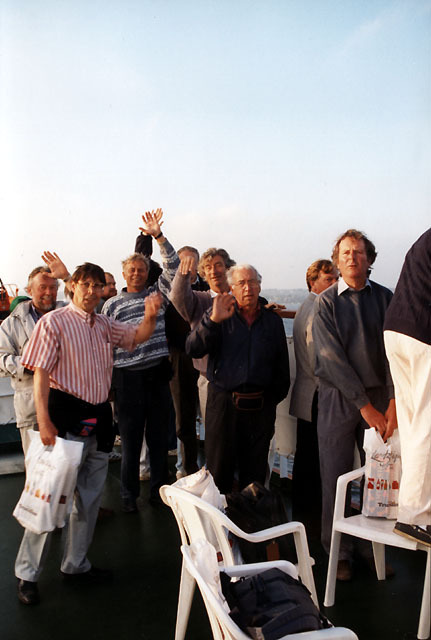 The tenth member of the Tourists in 1994 was Richard. I've left Richard until last as it gives me the perfect opportunity to embarrass him by posting this picture of him! 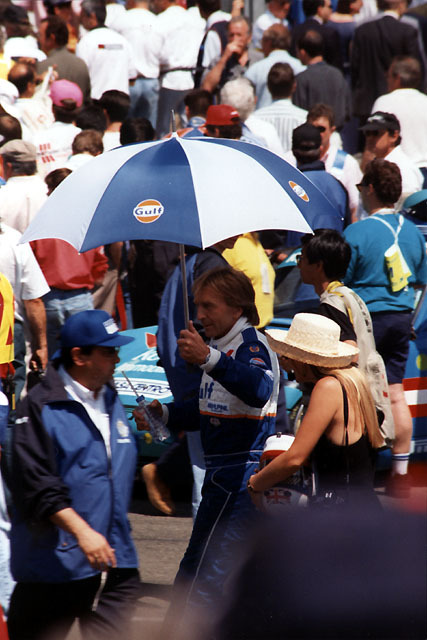 Richard had been to Le Mans with us in 1988 and 1991. (I've actually been promising Richard that he would appear on my web site before long and here he is at last. Richard, you are now officially famous!). The entry list for the race in 1994 was interesting. Disappointing (to me) in the sense that the glorious Toyotas and Peugeots from '92 and '93 were now gone, but it was pleasing to see the strengthening of the GT field, following the ACO's initial toe in the water in 1993. Toyota were back with their now rather ageing turbo cars and, incredibly, we still had Porsche 962s in the field. 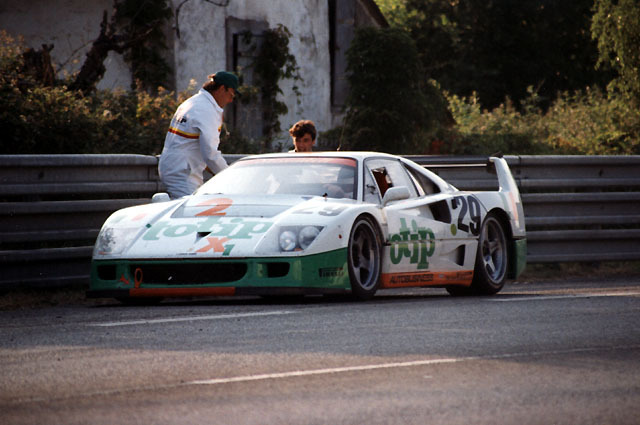 One of the most intriguing entries was the Gulf Kremer Porsche K8, in effect an open-topped 962, to be driven by Robin Donovan, Jurgen Laessig and Derek Bell (who was telling everyone who would listen that this was to be his last Le Mans!). 1994 also saw two entries which turned out to be of great significance for the future, although I doubt that many of us appreciated it at the time. The first Chrysler (then Dodge) Vipers at Le Mans. Our trip began in the usual way with a ferry crossing, this time to Caen. We took three cars over this year, Ian and Martin with their BM's and Chris with his Golf VR6, in which I was a passenger. Having made a trip to the Pegasus Bridge (the scene of D-Day celebrations only a coujple of weeks before on 6th June), we made our way to Buais. We were staying at Le Relais du Bois Leger down the road in St. Symphorien des Monts, a regular haunt from the past, although we took an excellent evening meal at Le Rotisserie Normande (another one of our favourite spots) in Buais. (That was where Richard's photo was taken). We had a really good evening (despite Alan feeling a little out of sorts), meeting up again with M. "Le Bigot" and his wife, who had (I think) passed on their restaurant to another member of the family. (I don't really know what Monsieur's name was. He was always referred to as M. "Le Bigot", but I don't know why and I don't know if that is how it should have been spelled!). After finally getting to bed around 2 am we made the journey on Saturday morning from St. Symphorien to Le Grand Luce. 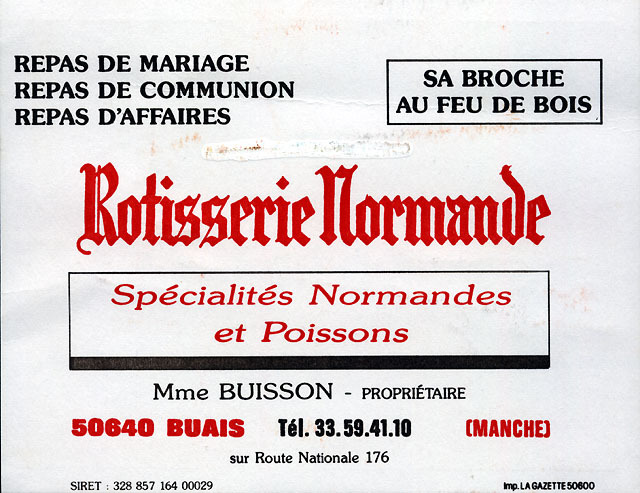 Regular readers will know that the Hotel Restaurant Le Cheval Blanc in Le Grand Luce has become another haunt, but in 1994 I was making my first visit. After a beer or two, it was off to the circuit. The weather was looking very good and it was out with the sun hats and sun cream (even a pair of shorts for Jim!). We managed to grab ourselves a pretty good spot on the tribunes opposite the pits, from where we were able to watch the real action of the 24 Hours (i.e. the arrival on the start/finish straight of the Hawaiian Tropic girls!) and, of course, from where I was able to get one or two good shots of cars and drivers. I always found it somewhat ironic that the ACO allowed the man who did so much harm to sportscar racing to start the greatest sports car race of them all. Not needing too much help from Monsieur Balestre, the ACO soon had the 1994 24 Hours of Le Mans under way in the brilliant sunshine. After watching the race from the tribunes for an hour or so, the heat soon got to us so it was time for a walk down to the Ford Chicane for a few beers. 1994, of course, was the year of the "imposter" GT's, as I took to calling them. I am referring of course to the two Dauer Porsches. Later experts would decry the involvement of the GT1 cars from Nissan, Mercedes, Porsche and others, but, to my mind, the ACO's acceptance of the entry of these two cars was by far a worse decision. The cars were effectively Porsche 962s and although they had to run on less rubber and with other modifications to bring them within the GT1 class rules, there is no doubt that if they were within the terms of the rule book, they were certainly outside the spirit of it. As usual, we had a good wander around the circuit and down to the Esses and Tertre Rouge before heading off for the Mulsanne. We parked up in the usual field and headed off to watch the cars over the fences at the Restaurant des 24 Heures. Only this time, when we got there, we found we didn't have to do our customary "perching" on tables and lumps of concrete. Instead, we walked into the restaurant (which was very quiet indeed), straight out of their front door into the area in front of the restaurant, separated from the track by just the triple-layer armco and a very flimsy looking fence! There wasn't a gendarme in sight (very unusual) and we must have spent about an hour here (much longer than we had originally intended). I was able to get some quite good shots. With a little reluctance (actually quite a lot on my part! ), we finally dragged ourselves away from this fantastic vantage-point to go and eat. Once again, we took an excellent evening meal at Le Belinois at Monce en Belin. After that, it was back to the circuit as usual, to see how the battle between the Toyotas and the imposter Porsches was getting on. It was looking quite good at this time for the Toyotas, with the Irvine/Martini/Krosnoff car gaining a full lap advantage by 5 am. The guys were very fired up to win the race after the recent death of SARD team mate Roland Ratzenberger at that horrific Imola weekend, but eventually their efforts proved to be good enough only for a last-minute second place, hard-earned by a charging Eddie Irvine. I have to say that the win by the Baldi/Dalmas/Heywood Porsche left a bitter taste in the mouths of most of the Tourists. I had my usual stint during the night and wandered around Tertre Rouge, The Esses, Dunlop and the Tribunes, while the others grabbed a few hours of shut-eye back at Le Grand Luce. On the Sunday I was picked up by Ian and taken back to Le Grand Luce for breakfast, before we returned to the circuit at Indianapolis and Arnage. I still soldiered on with my camera while some of those around me slept again on the banking there. As the afternoon drew on and the leading Toyota suffered it's heartbreaking gear linkage problem, we headed back to the garages to see out the last hour or so of the race. Come the end of the race, we made our way from the circuit and drove to our Sunday evening port of call at Concale (near St. Malo). We were staying at another place we had frequented several times, the Hotel Continental, where incidentally, the hotelier spoke excellent English. It was here that I disgraced myself by literally falling asleep at the table over my main course! Well, I hadn't slept at all since Friday night! It was a shame though, the food was very good - great seafood if you like it! On Monday we spent a few hours down in the museum on Utah Beach, before heading back to Cherbourg for our return trip to Blighty. (Poole on this occasion). Leaving the result of the race completely aside, '94 was a really good year. Great company, super weather, all in all, a very good trip.